The Book Review: "The Healthy Mind Cookbook" by Rebecca Katz with Mat Edelson | .Sometimes Raw. Thanks to Blogging for Books and the publisher for providing me with a free copy in exchange for an honest review. I have not heard about Rebecca Katz or her blog before but what drew my attention to this book the most was the cover and title. This does not affect my opinion of the content or the book in my review. Rebecca Katz is a national speaker and chef and the author of several books. She has worked with top wellness- leaders throughout the country (Deepak Chopra and others). 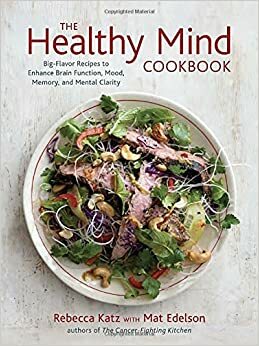 In “The Healthy Mind Cookbook” she researched the latest news on the brain to figure out what food works well in combination with the brain to improve emotion, the brain’s ability to control cognition as well as physical functions. She also mentioned that many diseases like ADHD, brain fog, fatigue, depression and many more could improve if you simply eat right. I, as a food enthusiast, think the same way and I loved reading this book. “This book is all about giving your brain the right fuel to do the job you want it to do”. The book starts out with research on the brain which I thought was very interesting. Katz mentions how stress, anxiety and depression might be related to the food we eat as well as memory, cognition and learning. You will learn a lot about the brain and how it functions in her nicely written overview. Eating healthier is on my agenda for a long time – hence the name of my blog “Sometimes Raw”. I love to try new recipes and diets but sometimes it is difficult to find the right ones. Or to find recipes that taste good and are fairly easy to make without having to go to the store for only exotic ingredients that you use for this dish only. Katz’s book is awesome if you like to try new recipes that are easy to follow, with a lot of vegetables and spices and awesome illustrations. I skimmed through all the recipes and have tries many already. One of my favorite part about the book is Chapter 2 and The Culinary Pharmacy. This and “Building Mind-Blowing Taste &Flavor in Chapter 3 are chapters you can always go back to and read about a plethora of ingredients with additional notes about how they can enhance your mood, sleep, energy and more. This cookbook is very health conscious and aimed mostly at a diet of vegetables, nuts, grains and once in a while some meat or fish. And now that cold, snow and winter is around the corner I love to curl up inside with a nice hot bowl of soup. In the book you will find an entire chapter on soups. Yay! I also enjoyed Chapter 7 “Anytime Foods” when Katz shares recipes like muffins, falafel, frittatas, hummus (which is so good!) and many salads. Other recipes range from main courses to desserts, to Tonics and Elixirs. Rebecca Katz also shares Eric Gover’s Perfect Cup of Matcha! I love Matcha! Read my article here. The “Thai It Up Steak Salad” is on my to-try-for-sure-list! Pingback: Five Things | .Sometimes Raw.